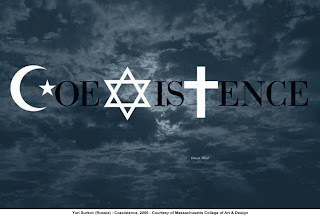 I like this poster because instead of just writing the word coexistence, they chose to make their poster stand out be replacing some of the letters with pictures. This made the poster more eye catching and it conveyed a different meaning. 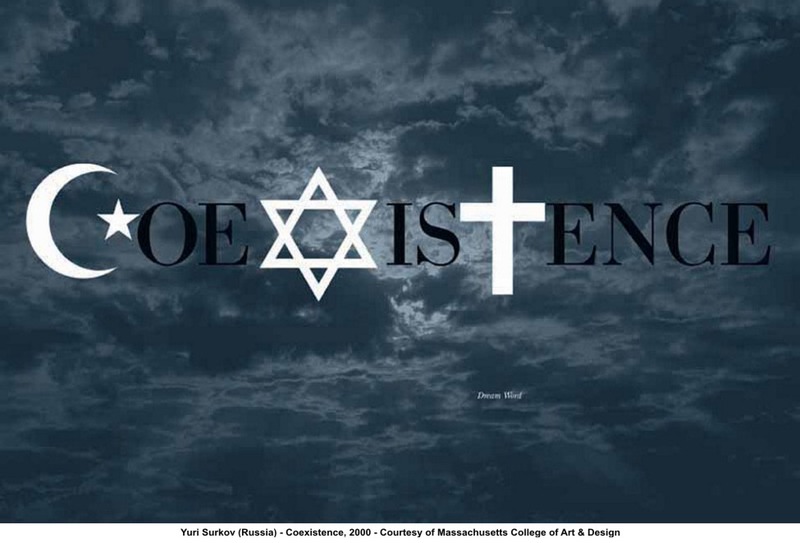 First you have the word, but when you look at the letters you see the moon and a star, the jewish star, and a cross. Be looking at this you can infer this poster does not just wish for the people to live peacefully together but they specifically want people of different religions to get along. Just by changing a few elements of the design the artist conveyed a completely different and more powerful meaning. The text is what portrays the meaning of the picture and without it the viewer would be lost, but the images give specific meaning to the message. The relationship between the image in the back and the words is that the dark sky provides a contrast for the picture elements to stand out more and that the image of the "heavens" means we can find unity in whatever we might believe. The vastness of the sky implies there is room for whatever one's beliefs are. I like the way the artist portrayed so many meanings in this simple picture but also left the meaning up for interpretation as well. When looking at the picture, your own experiences provide a different meaning to what you can see. This image was also a favorite of mine because the text is the image. The words form the picture and give it its meaning. At first glance we see the hands holding up the peace sign. But when you look closer you see that making up the hand are words shaped to form and image. You can see the word trust makes up all the words. It is repeated over and over. You can infer that trust makes up peace. In order to have peace we must trust each other. 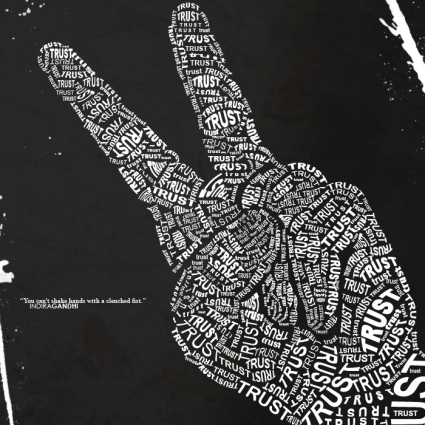 The artist conveys this message be having peace made up of the word trust rather than the other way around. The small decisions the artist make determine how the viewer will interpret their work. In this piece the artist used text not as an added element to a picture but as the picture, which I really liked. It made their piece interesting by their use of unconventional design elements.